Straighten Teeth Seamlessly – No Metal Required! Are you tired of hiding your teeth because you are insecure about alignment issues? If so, you know that there are many different orthodontic advancements available, but you do not want to deal with the restrictions or long treatment required for metal braces. Now, you can get the straight smile you have always wanted with a nearly invisible solution. At Advanced Dental Treatment Center, we offer Invisalign in Greenfield to move your teeth into their proper positions without wires and brackets. No Brackets & No Wires – Maintain Your Natural Appearance! Traditional braces use wires and brackets to pull your teeth into the proper alignment. While this is a reliable and effective solution to treat even the most complex bite and alignment issues, it does come with certain disadvantages. Not only are braces highly noticeable, but there are certain dietary and oral hygiene restrictions. Invisalign resolves the complications that are associated with metal braces to provide you with an alternative solution. The FDA-approved treatment uses a series of custom-made clear aligners that are worn over your teeth to gradually move them into position. You wear each one in the series for about a week before switching to the next. On average, it takes about 12 months to complete your treatment plan, leaving you with a straight, confident smile. To maintain your results, you will briefly require a retainer to prevent your teeth from moving back into their previous positions. Now, adults have come to prefer Invisalign in West Allis because it offers a discreet and sophisticated solution. The aligners are clear, so no one will be able to tell that you are wearing them. In addition, your treatment time is often shorter than that of traditional braces, allowing you to get a straight smile in less time. While using the aligners, you can still enjoy eating your favorite foods because there are no dietary restrictions. Since they are removable, you can eat and drink what you like. This also makes oral hygiene easy because there are no wires or brackets to brush or floss around. 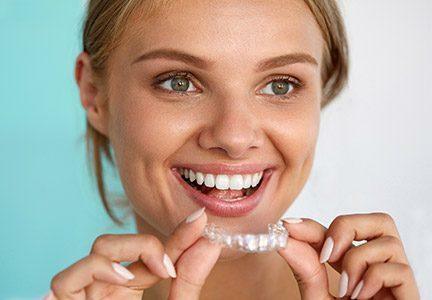 Without wires and brackets, you do not have to worry about irritation to the inside of your lips or cheeks because the aligners are smooth to enhance their comfort. Often, many find Invisalign to be a more convenient option as well. You will require fewer appointments because you will not need to have adjustment visits. However, you will still need to come in for a checkup every few weeks so we can monitor the progression of your treatment. Get a Straight Smile Today! 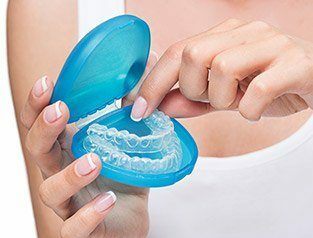 If you are ready to feel confident about the appearance of your teeth, it is time to see if Invisalign is right for you. After conducting a consultation to ensure that you are a candidate for the aligners, we will create a customized treatment plan to give you the smile that you have always wanted. To start your journey to a beautiful, straight smile, contact Advanced Dental Treatment Center today to schedule your consultation for Invisalign.